If you're in the greater Boston area this Friday, why not join the members of the New England branch of the Explorer's Club and come to my talk about early (pre-1922) Arctic films? It's open to the public, and the cost is only $10 -- and the weather outside will be providing a perfect scenic accompaniment, with temperatures in the single digits and plenty of snow. Everyone has seen -- or at least knows of, Robert Flaherty's Nanook of the North. It's often thought that this film came, as it were, out of the blue, and that nothing before it had come close to portraying "life in the actual Arctic" (this was Nanook's tagline). But in fact a great variety of films, both factual and fictional, catered to public interest in the regions of eternal frost -- with more than 20 documentaries and expedition films, as well as hundreds of dramatic ones. 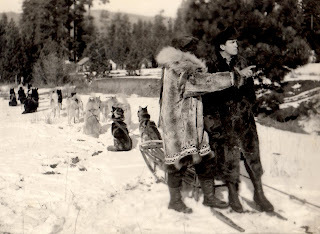 In fact, up through 1920, there were as many films set in the frozen North as in the wild West, and if things had worked out a little differently, we might still be watching "Northerns" today instead of "Westerns." The ingredients, of course, were very similar: replace the black-hatted bad guy with a cheating claim-jumping womanizer, replace the town sheriff with a chisel-chinned mountie, and replace horseback chases with dog-team ones, and you've got the basic idea. Many great directors, among them Rollin Sturgeon and Cecil B. DeMille, made "Northerns" back in the day, and though only a few survive today, we have some film stills, scripts, posters, and other ephemera that enable us to know a great deal about them. There were even some very sensitive ethnographic and native films, including 1910's "The Way of the Eskimo" from Selig Polyscope -- the first Inuit-written film to include an all-Inuit cast, nearly a century before Atanarjuat. My talk, "Heroes and Villains of the Frozen North," will take place on Friday, January 25th, at 8 p.m. (preceded by a social hour that starts at 7) at the Doubletree Guest Suites Hotel, 400 Soldiers Field Road, Boston. I'll be presenting some hitherto-unseen theatrical stills, along with brief clips from several of the surviving films. Best of luck with the lecture Russell, I'm sorry I won't be able to attend. Sounds like great fun! I hope all attendees have an enjoyable time! Glenn, sorry you can't make it -- some day or another, the denizens of both poles must gather under one roof -- hope it can be soon. And thanks, Jaeschylus! It looks more than interesting Russell. I hope that soon we could watch more of this kind of "Northerns" movies everyday on the TV instead the usual stuff.